Pristine preowned mens Rolex Day-Date (ref. 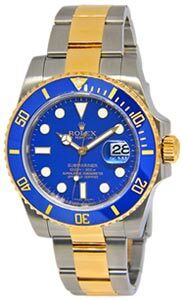 118238; D-series – 2005) in solid 18k yellow gold features champagne dial with Roman numerals, fluted bezel and President bracelet with deployant buckle. Comes with box and papers (dated December 2015). Retail: $31,350.